O SWEETEST JESUS! I unite my soul with Thine. I unite my heart, my spirit, my life, and my intentions with Thy Heart, Thy Spirit, Thy Life, and Thy intentions, and present them thus united to Thy Heavenly Father. Receive me, O Eternal Father, through the merits of Thy Divine Son, which I offer up to Thee with the priest and the entire Church. Hidden in His wounds, covered with His Blood, and adorned with His merits I appear before Thee. Cast me not away from Thy countenance, but receive me into the arms of Thy paternal goodness, and grant me the grace of salvation. O my God! I thank Thee for all Thy benefits, for Thy sacred Passion, and for the institution of the holy Sacraments, especially for the Most Holy Eucharist. HUMBLY prostrate before Thee, O Sacred Heart, I adore Thee, I praise Thee, I bless Thee, and I love Thee with all the strength and all the love of which my heart is capable; but I beseech Thee to increase its capacity and augment my love so that I may love Thee still more, and that this love may make me forever all Thine. This favor I ask for all hearts that are capable of loving Thee, but particularly for my own cold, rebellious, and unfaithful heart which has so long abused Thy graces, and ever resists and offends Thee. I am so lukewarm in Thy service that, were it not for Thy infinite mercy Thou wouldst long since have vomited me forth and cast me from Thee as an object of horror and disgust, deserving to suffer eternally all the rigors of Thy just anger. 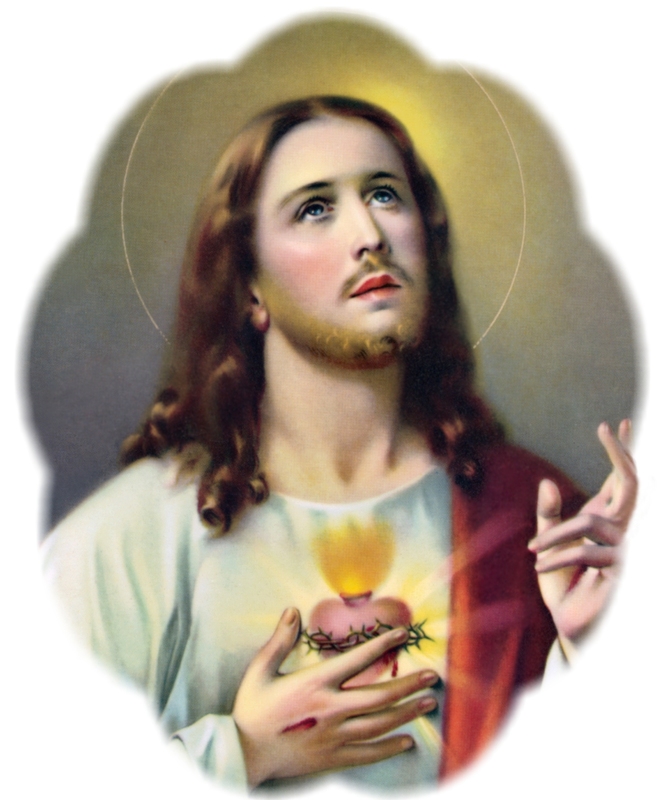 But I conjure Thee, O Sacred Heart of my Jesus! by that burning charity which consumed Thee as a Victim of love and suffering upon the Cross, and which will retain Thee as a Victim upon our altars until the end of time, to grant me, a poor miserable sinner, the pardon of all the sins which I have committed through ingratitude, forgetfulness, or want of fidelity, and all the other injuries which I have heaped upon Thee, and for which I repent from the bottom of my heart. I ask pardon for them with all the grief and regret of which I am capable. I would that I could shed my blood by means of all the torments imaginable, and thusS satisfy Thy Divine justice, and repair the outrages which I have committed against Thee. I accept beforehand all the sufferings with which Thou wilt be pleased to chastise me in this life, with the exception of being abandoned to myself and to sin, and of being thus deprived of Thy love. O most amiable Savior, do not give me over to such a dread shame as that of not loving Thee! Rather let me be tormented by all the pains of Hell than be one moment without loving Thee. O Divine Heart, source of all love and goodness! do not forget Thy mercies and condemn to eternal privation of Thy love a heart which desires to live only for Thee, and to breathe and aspire only for Thy love in time and eternity! O most loving heart of my Lord Jesus Christ, graciously hear my humble petition, and grant me the grace I most earnestly ask of Thee, namely, that of my true conversion. I have such a detestation and horror for the past, that I would rather be plunged into the abyss of Hell than return and continue as before; but, my Jesus, if Thou wilt condemn me to the flames, let them be those of Thy pure love. Yes, cast me into this burning furnace, to remove every vestige of my past offenses. And if the excess of Thy goodness prompt Thee to accord me still another grace, I ask of Thee nothing less than the most sweet torment of love. Grant, I beseech Thee, that I may be consumed thereby and entirely transformed into Thee. In revenge for my not having loved Thee, and for my inordinate self-love, pierce, O Jesus, my ungrateful heart through and through with the dart of Thy pure love, in such a manner that henceforth it may be incapable of containing any earthly or human affection, but solely the plenitude of Thy pure love, which shall leave me no other liberty but that of loving Thee in suffering and in the accomplishment of Thy most holy will in all things. These, then, most Sacred Heart, are the graces which I humbly beseech Thee to grant unto me, and to all those hearts which are capable of loving Thee; and I ask for them and for myself the grace of living and dying in this same holy love. Amen. ETERNAL FATHER! I offer up to Thee my intellect, that it may learn to know Thee alone. Sweetest Jesus! I offer up to Thee my memory, that it may remember Thee alone. Holy Ghost, Spirit of charity! I offer up to Thee my will, that Thou mayest enkindle and warm it by Thy Divine love. Adorn my soul with Thy seven gifts, and let me become Thy pure temple. Fill me with Thy grace, and prepare my heart to receive spiritually my God. Jesus, my God! as my sins render me unworthy to receive Thee into my heart, do Thou receive me into Thine, and unite me so perfectly with It that nothing may ever be able to separate me even for a moment from Thee. Engulf my misery and my nothingness in the abyss of Thy mercy, that I, changed into Thee, may henceforth live only for Thee, by Thee, and in Thee. Come, therefore, Thou, my only satisfaction, come to take possession of this heart, which belongs to Thee, and cannot live one moment without Thee. I THANK Thee, O my Savior, that Thou wast pleased to unite Thyself spiritually with me. I offer up myself totally and without reserve to Thee, that it may please Thee to fulfill in me all Thou dost desire to accomplish. Destroy in me the spirit of self-love, humble in me whatever proudly asserts itself, and destroy whatever is opposed to Thee.